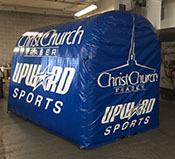 Cogswell Creations Blast Tunnels are classic sports entrance tunnels detailed with your colors and logos. Our Blast Tunnel packages are described below. 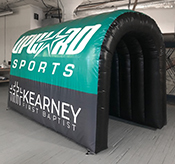 This is our largest tunnel for high visibility on outdoor fields. It makes an impressive display with large graphic areas that are highly customizable. We have various choices for color design and graphic placement, or we can work with you to create an original look. The standard length is 25 feet, but longer or shorter lengths are available. 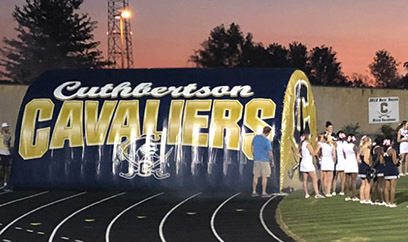 Our Multi-Sport Tunnel has the same awesome graphics in a size that is ideal for use at both outdoor and indoor activities such as football, basketball, soccer, pep rallies, etc. The Medium Tunnel can also be used as an extension for the Football Helmet Tunnel. These two together can create a perfect combination for schools with a diverse athletic department anchored by the football program. When not being used on the football field the combo can be split so the medium tunnel can be used by itself for other sports. The Junior Tunnel is specifically meant for 12 year-old and under youth leagues. The package includes choice of colors, printed graphics on both sides, internal blower, and storage bag. The standard version does not include door flaps, though we can add them if needed. Many youth leagues, Upward programs, and church/community organizations include player introductions as a point of pride for thier young athletes.